Protect your skin with the right products. When it comes to sun exposure, nothing is more important than protecting your skin. Many people love a beautiful sun-kissed glow, while others prefer a deep, dark tan that changes their look considerably. Then there are those individuals whose exposure is minimal - perhaps they just enjoy outdoor activities but don't necessarily venture outdoors in order to achieve darker skin. Even they suffer the harmful effects of the sun's penetrating rays, though. Who better to turn to than a couple of experts for the full scoop on what makes proper sun care so important? We sat down with the creators of COOLA Sunblock, Chris Birchby and Kristian Burrows, to find out all about their company and what we can all do to improve our sun safety skills. LTK: Tell us a bit about COOLA and how your company started. COOLA: It is a two part story: Chris started playing online poker a lot and I told him, "Fine - however, you have to squirrel away some of your winnings so we can have a back up!" The company itself came as an idea after watching surfers in Costa Rica getting totally burnt and learning that our parents had been diagnosed with skin cancer. Nothing on the market seemed to address the importance of antioxidants and hydrating that is needed to complement the active ingredients or SPF factor in sunblock. LTK: Your line is unique in its use of organic extracts. What prompted you to include these ingredients in your sun care products? COOLA: We eat only organic and try to live a "carbon conscious" lifestyle. COOLA is an extension of that set of beliefs. We believe in the high quality that the organic ingredients deliver. Every aspect of the company is made in the USA, and that really insures that we can have not only the best homegrown ingredients, but quality control and responsible business choices as well. LTK: Do you follow a specific sun care regimen to support your active outdoor lifestyle? If so, what is it? COOLA: Firstly we eat well. We consume foods with vitamin D and other anti-aging, high vitamin properties. We do a lot of outdoor exercise in the early morning before the sun is too high. Sunscreen should most often be applied indoors and accompanied by hats and sunglasses. We love the sun, however, and can't help being outside during high-risk sun damaging time, so we strive to lessen any of the sun's damage when enjoying our favorite activities. We are coming out with a USDA certified organic COOLA After Sun skin care regimen to complement the Sun Protection line, which should help prepare and repair skin on a daily basis. Make smart, safety-conscious decisions for your skin. LTK: Are your products safe for sensitive, easily irritated skin? Do you advise a specific regimen for individuals whose skin is extra sensitive? COOLA: Our products are perfect for sensitive skin. They are some of the mildest yet proactive SPF 30 formulas available. All of our aromatherapeutic scents are available in a true unscented. A lot of SPF products put a "mask" scent in their unscented products - we do not. Our unscented products are 100% fragrance free. 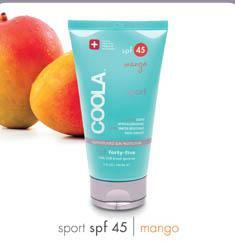 COOLA Face is gentle enough to be a daytime hydrator as well as a full SPF 30. Many of the skin care day moisturizers contain some SPF, but they are not formulated as a SPF. Think of us in the reverse - we are everything that a daily moisturizer is, as well as full broad spectrum UVA/UVB protection. LTK: What are your thoughts on the addition of SPF in mainstream, everyday products such as lip balms and foundations? Do you have any plans to introduce similar items to your line? COOLA: We are expanding the line to include more sun care products, an after sun hydrating line, and a hydrating antioxidant mist available in a travel size. We will be adding a Baby Block 60 as well. LTK: Give it to us straight. What is the bare minimum SPF everyone should be wearing? Is it enough to just slather it on the areas exposed to the sun, or is it important to be covered from head to toe? We started COOLA with the idea that we would only create at least SPF 30 products. They give you all the protection you should need. The higher SPFs offer a diminishing amount of increased protection, and though minute, the difference is still discernable. Our SPF 45 Sport prevents approximately 99% of harmful rays from affecting one's skin over a certain time period without reapplication, while our SPF 30 prevents slightly over 97%. When you drop down to something like an SPF 15 or 8, the amount protected continues to decrease. LTK: What does the future hold for COOLA? COOLA: We hope to keep our company growing, and to be able to use it as a platform to encourage people to support the environment, support local businesses, engage in cancer awareness and prevention, and provide many happy and guilt-free experiences in the sun. With all the information available about the sun's harmful effects on skin, it just makes sense to take precaution and protect your skin. Whether you use COOLA or another brand of sunblock, be sure to slather it on whenever you plan to spend time in the great outdoors.